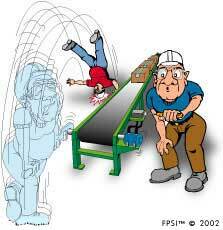 Topic: Accident related to freeing a jammed conveyor. A millwright was fatally injured as a result of injuries he sustained while attempting to free a jammed conveyor. The accident occurred when he was trying to break the conveyor free after it unexpectedly jammed during production. To break it loose, he grasped the conveyor drive shaft with the jaws of a long pipe wrench. He then straddled the long handle of the pipe wrench with his body. He used his body weight and the lengthy pipe wrench handle as a makeshift lever mechanism to attempt to free the jammed conveyor. As he "bounced" on the handle, the conveyor unexpectedly broke loose, hurling the victim to his death. He sustained severe neck and head injuries. The millwright reportedly received a call from the machine operator that the loaded conveyor had unexpectedly stopped during production. During his initial investigation, he found no visual signs of physical damage that would cause the conveyor to jam. He apparently checked the pressure gauge on the power unit, and learned that the pressure was normal. After a visual inspection of the machine, he could not determine if the problem was caused by a mechanical or hydraulic problem. He apparently decided to try and force the conveyor drive shaft to rotate. The only device that he felt could accomplish this was a make-shift leverage system comprised of a pipe wrench with a long shaft, and his body weight. During his initial attempt to free the conveyor, the power unit was apparently switched off. He fastened the jaws of the pipe wrench firmly around the conveyor drive shaft. With his full body weight, he apparently "bounced" on the handle. The conveyor showed no signs of moving. After several attempts, he gave up. He then advanced his trial-and-error troubleshooting techniques to the next level. He decided to hold full system pressure at the hydraulic motor, while at the same time applying torque, using his makeshift lever mechanism. He started the power unit, and placed the selector in "manual" mode. He asked a colleague to override the solenoid-operated directional control valve by engaging the override pushpin located on the end of the solenoid. Once again, he fastened the pipe wrench jaws around the conveyor drive shaft, and began his ritual of straddling the handle with his body, and "bouncing" on it with his full body weight. After a few attempts, the conveyor unexpectedly broke free. With his body straddled across the handle, and the sharp teeth of the pipe wrench jaws firmly clenched to the steel conveyor drive shaft, the pipe wrench handle whipped around, catapulting him effortlesly, high into the air, as if he were a rag-doll. The impact of his hitting the ground, caused him to suffer fatal injuries. The victim was using trial-and-error methods to test a hydraulic system. The victim was using trial-and-error methods to free a jammed conveyor. The victim had no formal hydraulics training. The victim had received no formal training in hydraulic motor testing. Training for supervisors did not include key safety issues for this procedure. A similar incident had reportedly occirred while attempting to test a hydraulic motor. However, since it resulted in a non-injury accident, it had not been reported or investigated. The victim had worked a total of 20 years as a millwright, and had no formal hydraulics training. Previous interviews confirmed that he was unfamiliar with hydraulics. If you are a supervisor or manager, insure that every person who works on and around hydraulics, receives the appropriate technical training - DO NOT TAKE ON-THE-JOB EXPERIENCE INTO CONSIDERATION! If you are a supervisor or a manager, insure that every person who works on and around hydraulics receives the appropriate safety training. Insure that all supervisors and managers receive hydraulic safety training. If you work on or around hydraulics, and have never received formal training, make an application for training immediately. If you are asked to do a job that you are unfamiliar with, tell your supervisor. NEVER attempt to stall a hydraulic motor shaft by using a pipe wrench, chain, cable, pry-bar, or any other unconventional mechanical means - motor torque is a function of pressure and displacement, and can be grossly underestimated. Compose Job Safety Breakdowns (JSB's) for all unconventional tasks. Provide employees with appropriate diagnostic instrumentation. Have your safety personnel undergo hydraulic safety training.